From the mind that brought you Flappy Bird, something equally difficult anbd frustrating! Flappy Bird creator Dong Nguyen is back, and with a vengeance. In his latest creation Swing Copters, you're charged with rising above several levels of girders armed with only a propeller cap and your two thumbs. And, perhaps unsurprisingly, it's one of the most difficult casual titles we've ever played. Don't be surprised if you "accidentally" send your favorite mobile device sailing. Swing Copters is made from the same kind of deviously addictive material as its predecessor Flappy Bird, so despite the fact that it's endlessly frustrating, you'll keep coming back to it over and over as you make an effort to rise to the top. Once you finally manage to score, you really do feel as though you've accomplished something amazing against all odds, as it's no easy feat to earn a high score. In fact, it's impressive as it stands to earn even a score of 1 or 2, so while learning to correct your copter's course is ridiculously hard, it can be rewarding as well. You'll earn medals for better and better performance to keep you going, however, if you can actually make it that far. And trust us when you say it's going to be a real feat if you do. If you thought Flappy Bird was rage-inducing, you haven't seen anything yet. Swing Copters is challenging, but mainly due to the frustrating controls that force you to constantly have to correct your course to the top. It's so difficult it almost feels broken in how hard it can actually be to earn a high score. Additionally, this is a game that simply doesn't seem to have taken much work to complete -- most of the art even seems to be recycled from Flappy Bird, just in pieces, and the music and sound effects can be grating. The top of the screen is also riddled with ads, unless you pay the $0.99 to get rid of them, but that doesn't afford you any other additional content. 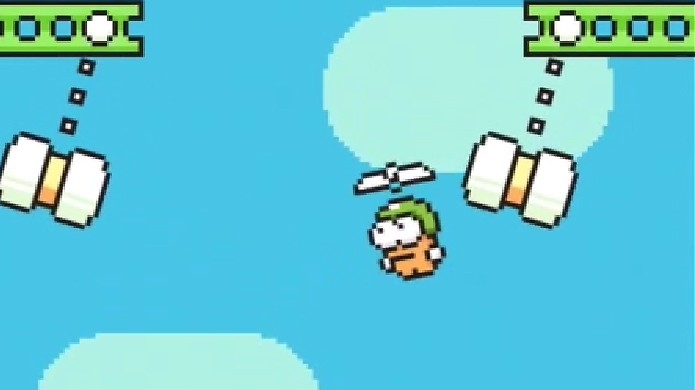 Swing Copters is just about what you'd expect from the creator of Flappy Bird, but you'll still be playing it for weeks to come. Objectively, it's nothing to write home about, but see if you'll be able to put it down if you haven't even reached a score of 1 before you get hit with the dreaded Game Over screen. Download Swing Copters for iOS and Android.